Defibrillation is a procedure used in the following types of medical emergencies – ventricular fibrillation or pulseless ventricular tachycardia. Ventricular fibrillation (VF) and pulseless ventricular tachycardia (VT) are two types of cardiac rhythms disturbances that can lead to ineffective ventricular contractions, potentially resulting in cardiac arrest and fatalilty. Ventricular fibrillation is nothing but, very rapid irregular contractions of the muscle fibers of the heart resulting in a lack of synchronisation between heartbeat and pulse. VF is considered the most serious cardiac rhythm disturbances, since this prohibits the heart from pumping blood, causing collapse and cardiac arrest. A person is suffering from Pulseless Ventricular tachycardia, when the ventricular rhythm is higher than normal i.e., the heart rate is more than 100 beats /minute (say 180/min) and the person is pulseless. 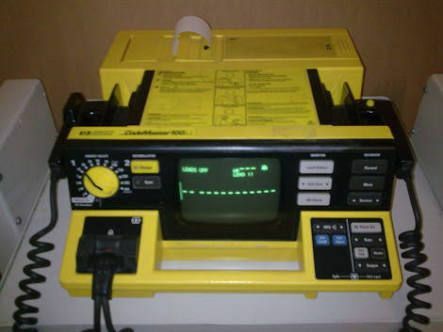 Defibrillator is a device used to perform defibrillation – essentially turning abnormal ECG rhythm into normal rhythm. A defibrillator provides electric shock that basically stops the heart briefly, so that it can start rhythmically contracting again. Type of shock that sends electrical current in a single direction from an electrode on one side of the patient’s chest to a second electrode on the other side. This technology is known as monophasic waveform defibrillation. Delivers current of one polarity. Current travels in one direction through the patient’s heart from one paddle to another. Electricity is sent from one electrode to the other in the first phase of this waveform, followed by a return back to the originating electrode in the second phase. 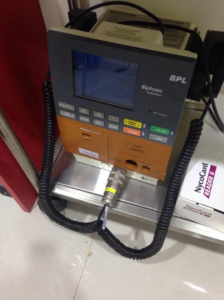 This technology is known as biphasic waveform defibrillation. The current travels towards the positive paddle and then reverse back. 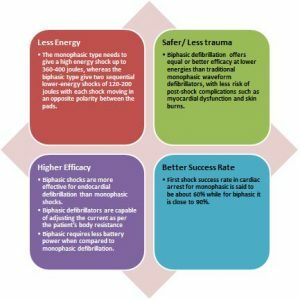 WHY CHOOSE BIPHASIC OVER MONOPHASIC DEFIBRILLATOR? Energy Usage Energy required for atrial fibrillation is 200 joules, atrial flutter is100 joules, ventricular tachycardia with a pulse- 200 joules and for ventricular fibrillation or pulse-less ventricular tachycardia, 360 joules Energy required for atrial fibrillation is between120 to 200 joules, atrial flutter- 50 to 100 joules, for ventricular tachycardia with a pulse, 100 joules and for ventricular fibrillation or pulse less ventricular tachycardia-150 joules Biphasic shocks are more effective for endocardial defibrillation than monophasic shocks. The monophasic defibrillator gives high energy shocks compared to biphasic defibrillator for the same efficacy. Efficacy & Efficiency Monophasic defibrillators are not that efficient at lower energies. Requires less battery power, can manually or automatically adjust the strength of the current Biphasic defibrillators require less battery power since they use lesser energy and are also more effective as they can adjust energy requirement based on patient body. Biphasic defibrillators deliver current in two directions, unlike conventional monophasic defibrillators. In the first phase, the current moves from one paddle to the other as with monophasic defibrillators. During the second phase, the current flow reverses direction. Biphasic waveforms lower the electrical threshold for successful defibrillation. Biphasic waveforms adjust for impedance by varying the characteristics of the waveforms. This ensures that high-impedance persons will have the same chance for survival as those who are of low impedance. Biphasic defibrillation offers equal or better efficacy at lower energies than traditional monophasic waveform defibrillators, with less risk of post-shock complications such as myocardial dysfunction and skin burns. safer since chances of adverse impact on heart muscle or burn is lesser with lower current passage as well the current is adjustable for patient’s body impedance in case of biphasic. Sleep apnea in IndiansWhy are Autoclaves more in demand than other Sterilizers?